We've gone from capris and sandals to long pants and sleeves in the past week. Need a warm breakfast to take off the morning chill? 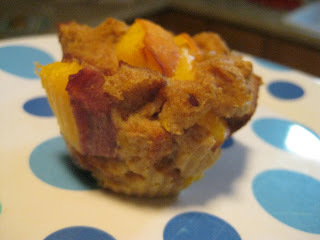 These individual french toast "cupcakes"(R's description) could be the perfect thing. 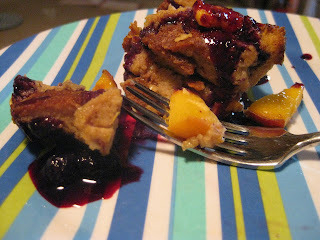 Full of whole grains, fruit and lean protein, these mini-french toasts are "oh-my-goodness" yummy. R, G, and I made these a recent weekend morning. I am still dreaming about them. They are a perfect way to use up old bread, and the most beautiful thing is they can be prepared the night before and baked the next morning. I used peaches, but I am guessing pears, berries, thinly sliced apple or dried fruit would work too. We made a quick blueberry compote (compote--a word that makes it sound hard to make, when in fact, it couldn't be easier), but simple maple syrup would work too. Combine the first seven ingredients in a large bowl, whisking very well to ensure complete incorporation of the eggs to the other ingredients. 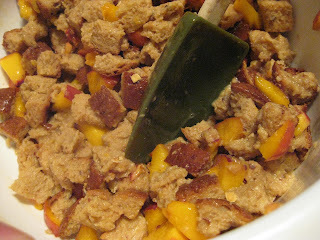 Add the bread and peach, and stir to combine. Let the mixture sit for 5-7 minutes, to allow the bread to fully soak up the egg mixture. Stir again and set aside. 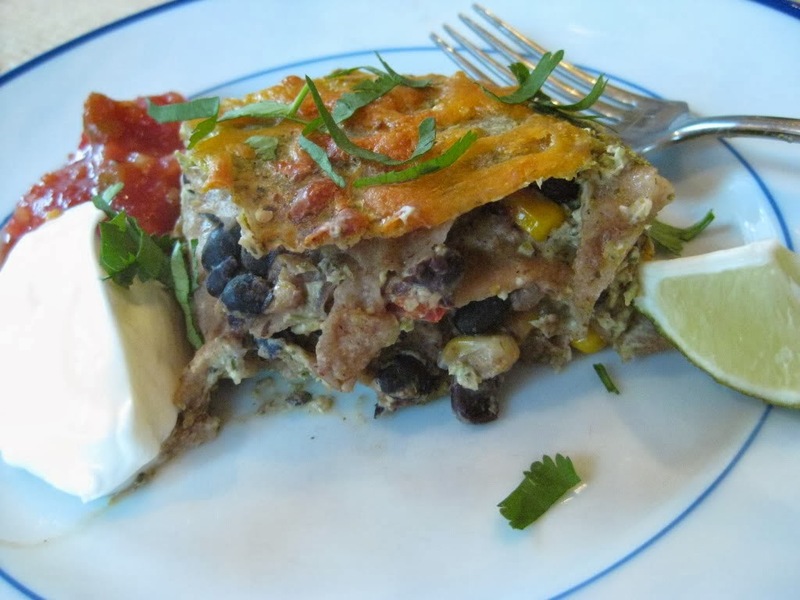 If using immediately, line a muffin tin pan with 12 liners. (Side note: I love using these). 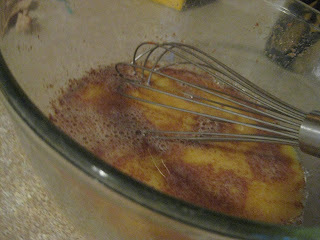 Spoon the french toast mixture amongst all 12 holes evenly. Bake 20-25 minutes, or until the top begins to brown a bit. Serve with maple syrup or blueberry compote (to make the blueberry compote, combine the blueberries, water and maple syrup in a small sauce pan. Bring to a boil and then let simmer about 10 minutes). Note: If you want to make the mixture ahead, simply leave it a bowl covered with plastic wrap overnight. 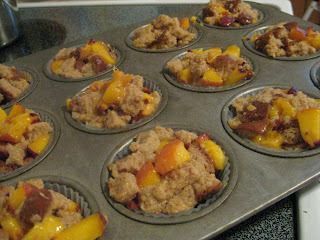 Fill the muffin tins in the morning, and add 5-10 minutes to your baking time. These "cupcakes" make me all warm inside on a cool fall morning. Looks delish! I'd bet they'd even pretty tasty without fruit. You know, if you wanted to make them this week and didn't have any fruit to add to it on hand...not that I would do that! You read my mind. I was wanting a recipe for something like this. And BTW, that picture of G in the kitchen sink on your header always makes me smile. He is adorable. Wow! Definitely going on my list for this weekend. Maybe for a quick breakfast in the car on the way to the race. SM-I think R would prefer them fruit-free, as he is a purist. If you try them that way, let me know what you think! RC-Hope they make your morning sickness a bit less "ugh." J-They do crumble, so be careful in the car! This looks wonderful!!!!!!!!! I love the individuals!